Like the London and York Dungeons, the Edinburgh Dungeon gives a graphic and spine-chilling look into Edinburgh's history. The dungeon employs every trick in the book to scare the life out of its visitors, and it does a pretty good job of it. But behind the scary masks and gruesome make up, it also offers an educational and interesting look at history, which makes it a fun way for children of all ages to learn. The Dungeon is a thrill-filled journey through a thousand years of Scotland's most dramatic and bloody history, and is very funny as well as frightening. The tour takes about 80 minutes and includes 11 live shows and two underground rides as well as incredible sets, disturbing sounds and disgusting smells. Visitors will come face to face with some sinister characters, including serial killers Burke and Hare, cannibal Sawney Bean and Scottish hero William Wallace, among others. 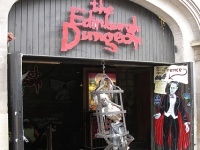 Although a huge highlight of a visit to the city for kids, Edinburgh Dungeon is also very popular with adults and nobody will judge you for showing up without children. Booking online not only gets you a discount, it allows you to bypass the often-lengthy queues at the entrance, and is therefore highly recommended. Opening times: Open daily. Opening hours vary, but are generally from 10am to 5pm. Check the official website for details. Admission: £16.50 (adults), £12.60 (children under 15). Concessions available. Note that tickets are cheaper if purchased online.